A collection of eight stories, from the author of Family Life, following modern Indians at home and abroad as they face the trials of marriage, parenthood, and assimilation. This slippery tone — at once amused and critical, resigned and outraged — infuses each of these eight haunting, revelatory stories. As in so much of contemporary American fiction, the attention here is on the conflicts and consolations between couples and family members in a naturalistic present day. Throughout, Sharma adheres unwaveringly to Raymond Carver’s dictum of 'no tricks,' telling his stories with bracingly direct, unassuming language. The dialogue is equally spare but true. But where some writers choose to obfuscate or minimize their ethnic background, Sharma is boldly forthright and probing ... perceptive, humane and pointed. Sharma’s ample talent and focus on technical literary achievement are on full display here even if the themes of the stories tend to overlap, a fact more obvious in a collection than when they were published individually. A keen Hemingway student, he has achieved commendable lucidity in his prose, making a conscious effort to free the narrative from weighty metaphors or descriptions of sense, smell or feel. In fact, he seems to be writing from a distance, as if wielding a very long nib, with each sentence a clean, measured stroke. That enables him to keep an even, if at times impersonal, voice that neither rises in anger nor quivers in sadness ... Sharma is clearly more comfortable writing about immigrant India than India itself, where his knowledge appears restricted to a certain time and place ... His considerable narrative prowess deserves full play in the wider world that he knows best, unashamedly immigrant and beyond. ...beautiful, funny, intelligent short stories ... His writing shines its clean light, never mercilessly or voyeuristically, on these characters winding round and round inside the muddled opacity of their lives and their thoughts ... There are quite a number of hapless, unhappy, hopeful men in these pages, often failing to understand women, who are the more unfathomable the more they are objects of desire ... Summarised like this, the stories sound so sad – and they are...Yet their vision is comic too, in the broadest, Chekhovian sense: robust and warm and ironic, not overwrought. The genius lies in the detail, in the gritty comical solidity of real things. 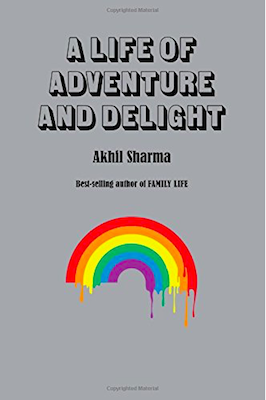 What did you think of A Life of Adventure and Delight?